Our tour to central Brazil covers diverse habitats that include the chapada (dry scrub) canyonlands, wetlands, grasslands, dry forest, and rivers of the Pantanal, and rainforest of the southern Amazon Basin. The tour begins in Cuiaba, gateway to the Pantanal. From there the tour visits Chapada dos Guimaraes National Park for 1½ days before flying to Alta Floresta at the edge of the southern Amazon Basin. A boat transfer takes us to Cristolino Jungle Lodge, our base for 4 full days of birding in the Amazon Basin. After a flight back to Cuiaba, the tour continues into the Pantanal with two nights stay at Pousada Piuval, two nights stay deeper into the Pantanal, two nights stay in Porto Jofre located on the Cuiaba River, where we'll spend most of two days searching for Jaguars along the river, and then a transfer back up the Transpaneira (highway through the Pantanal) back to Cuiaba with an overnight stay by the Rio Claro en route. 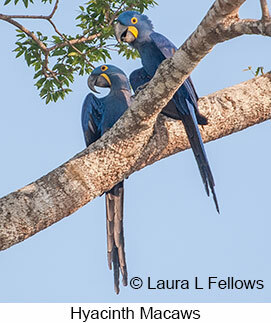 Certainly two of the many major highlights of the tour are the certain sightings of Hyacinth Macaws and the almost certain viewing of Jaguars along the Cuiaba River. These highlights may perhaps be outdone by the extraordinary birding and mammal viewing during our visit to the Amazon, but that all depends on what experience one prizes most at the end of this spectacular tour.